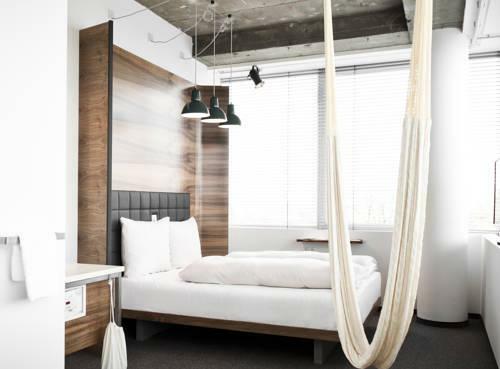 Daniel Vienna is a popular designer hotel with a ton of interesting peculiarities. It will definitely impress connoisseurs of modern style, adherents of healthy lifestyle, and artistic people. The hotel has a large private garden that is also used to grow organic fruit and vegetables, as well as spices and herbs. All the harvested fruit and vegetables are then used to cook food in Bakery, the hotel’s restaurant, so no wonder why the dishes are so delicious and homelike. There is also an unusual shop that sells magnificent honey and high-class locally made cosmetics. Paintings of outstanding Austrian painter Erwin Wurm are among main decorations of the hotel’s design. The prestigious Sofitel Vienna Stephansdom is open in another stylish and modern skyscraper. 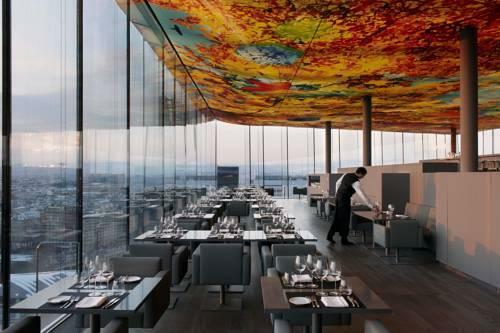 The design of this hotel is the result of work of Jean Nouvel. This hotel has several striking peculiarities, such as the unique Le Loft lounge bar that is open on the 19th floor of the skyscraper. Walls of the bar are made of thick glass, so it’s very comfortable to enjoy signature cocktails and admire the panorama of the city. The lounge bar is located on the perimeter of the skyscraper. It’s a magnificent place that is very popular with both locals and guests of the city. The ceiling is decorated with colorful wallpapers with futuristic ornaments and underwater life landscapes. The place looks particularly awesome in the evening, when artistic lighting makes the bar even more attractive. Every evening, curious travelers come to Sofitel Vienna Stephansdom in order to admire the unique masterpiece of designer art. 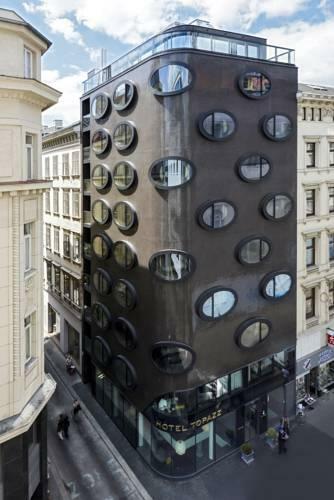 The five-star Topazz is open in one of the most unusual modern buildings in Vienna. The façade of the building is made of concrete and looks fabulous with large windows of an unusual oval shape. The fantastic building in industrial style looks very stylish and looks particularly amazing between historical constructions nearby. The one-of-a-kind design of the hotel was developed by Koloman Moser, an internationally famous artist. The unusual windows of the building serve an important purpose. They have quite large sills that were turned into lounge chairs by skilled designers. Therefore, guests of the hotel have a nice opportunity to lie on the soft sills and enjoy the panorama of the city. 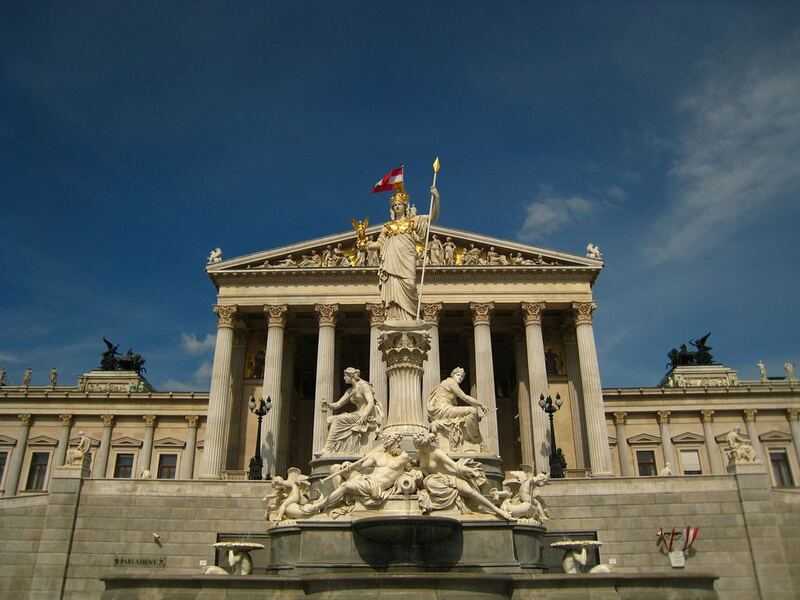 The elegant Ruby Sofie Hotel Vienna greeted first guests yet in 2014. This gorgeous hotel has many advantages, and the unusual location is one of them. It is open in a beautiful historic building of the former Sofiensäle concert hall. The hotel has its own radio, and all guests are welcome to listen to it in their rooms. The hotel was opened after an extensive restoration, but many elements of the original design, such as antique furniture, are still present in rooms and public areas. The modern hotel features contemporary design. The library and lounge area look fabulous with vintage furniture and magnificent artworks. This guide to unusual hotels of Vienna is protected by the copyright law. You can re-publish this content with mandatory attribution: direct and active hyperlink to www.orangesmile.com.